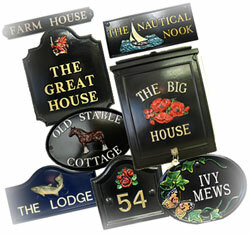 Custom house signs & post boxes from Hayne-West. Hayne-West is a long-established manufacturer of cast aluminium house signs, gate signs, house numbers, plaques, letter plates and post boxes, recognised for their distinctive quality and traditional appearance. It is a tribute to the superb quality of our products, high level of professionalism, expertise and excellent service that we are still out in front as a leading manufacturer. Hayne-West has also been the manufacturer of signs for the Royal Estates since 1986. Simply choose your own combination of shape, size, emblem, wording and colour and leave the rest to our skilled craftsmen to make a sign or post box that will enhance your home for many years to come. We welcome any feedback regarding our site. Manufactured from pure aluminium and finished in a choice of six durable baked-on powder-coated finishes, your house sign, number plaque or post box can be as simple or as decorative as you wish. As you browse through this web site you will see there are many patterns to choose from, in a range of sizes, to accommodate your own choice of wording and emblem. Our distinctive Hayne-West post boxes, designed and manufactured by ourselves, can also be personalised with your house name and/or number. The intricate detail and subtle shading during the final hand-painting ensures that the birds, animals, flowers, trees, buildings, etc., which can be used to decorate your sign or post box, looks authentic. These beautiful emblems are shown on our emblems page, many of which are in full colour. If you wish, our talented artists can replicate the colours and markings of your pet, your horse or perhaps your cattle breed onto the emblem of your choice. Simply send us your picture. of the outstanding quality that you can expect from us. Our Tips on choosing a sign or post box and frequently asked questions may also be helpful. But, if you are at all unsure or need further help, our experienced friendly members of staff are always pleased to discuss your requirements and, if you wish, e-mail you a picture of a rough layout of the lettering and emblem on our pattern before you place your order. As well as personalised nameplates and post boxes, we manufacture number plaques, commemorative plaques, memorial plaques, special plaques and post boxes for schools, historical plaques for buildings, and unique long-lasting personalised gifts to mark special occasions, such as birth, anniversary, wedding and Valentine’s day.